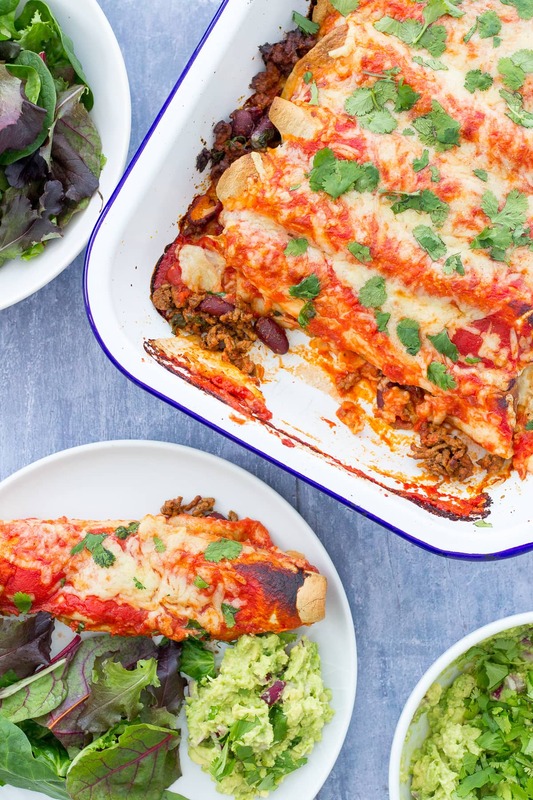 Quick, simple to prepare and packed full of delicious Mexican flavours, these Easy Beef Enchiladas are the perfect dinner to whip up on a busy weeknight, when you still want to eat well. Enjoy with all your favourite Mexican side dishes, such as guacamole and salsa!! Enchiladas in under 30 minutes! 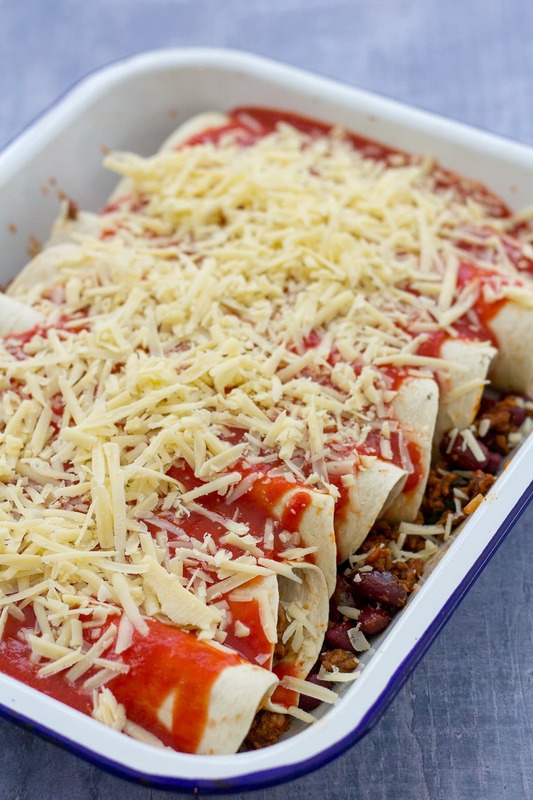 Depending on how you make them, Enchiladas can be a bit fiddly and time consuming to make – not in my house! My easy and speedy beef enchiladas can be made in just 30 minutes – perfect for busy weeknights. 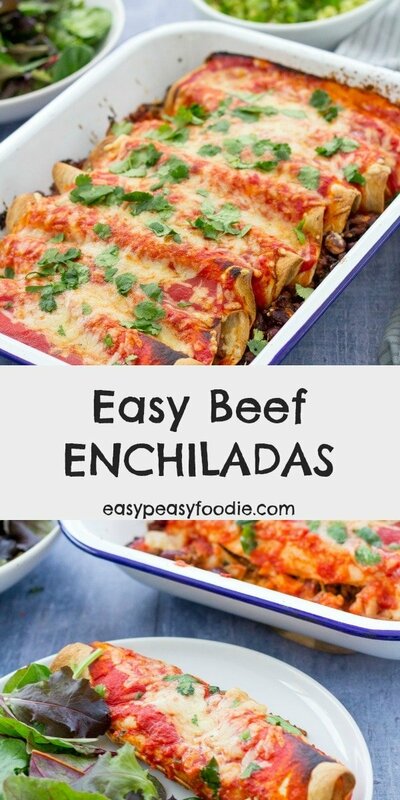 I am certainly not pretending my Easy Beef Enchiladas are in any way authentic – but they are tasty… and quick… and my kids love them. Which are my main criteria for midweek meals! 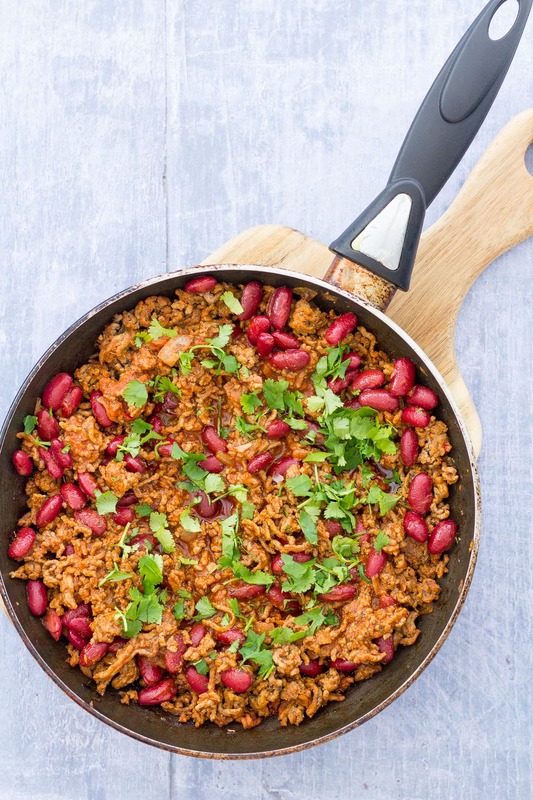 To make my Easy Beef Enchiladas quickly I’ve certainly taken a few shortcuts – I make a very simple filling from onions, beef mince, kidney beans, a little passata, chilli and spices. I wrap this mixture in tortillas and pour the rest of the passata over the top, then sprinkle liberally with cheddar cheese. 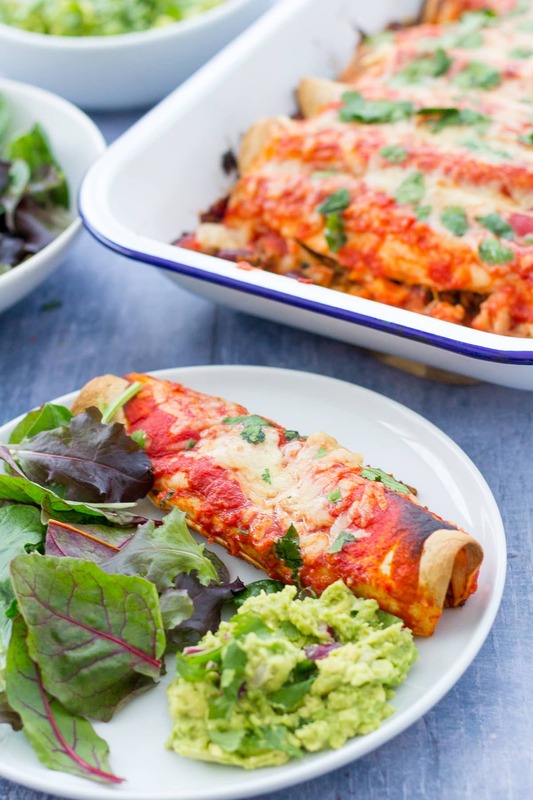 My beef enchiladas go into the oven for 15 minutes (just time to whip up some homemade guacamole or salsa fresca), then I top with a sprinkle of fresh coriander (cilantro) and serve at the table with a green salad and allow my lot to dig in! I realise that it’s more normal to serve a chilli sauce over tortillas, rather than passata – but I personally prefer passata. 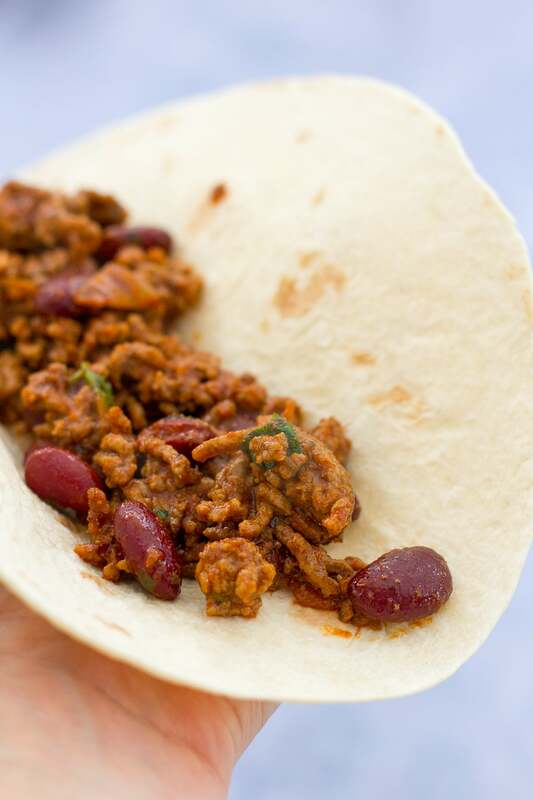 I like the contrast with the chilli in the tortilla filling…and it’s great for serving to kids, like mine, who don’t like their food too spicy. However, if you prefer a bit more heat, simply add some fresh chilli to the passata (either chopped up finely or blended in with a stick blender), before pouring over the filled tortillas. 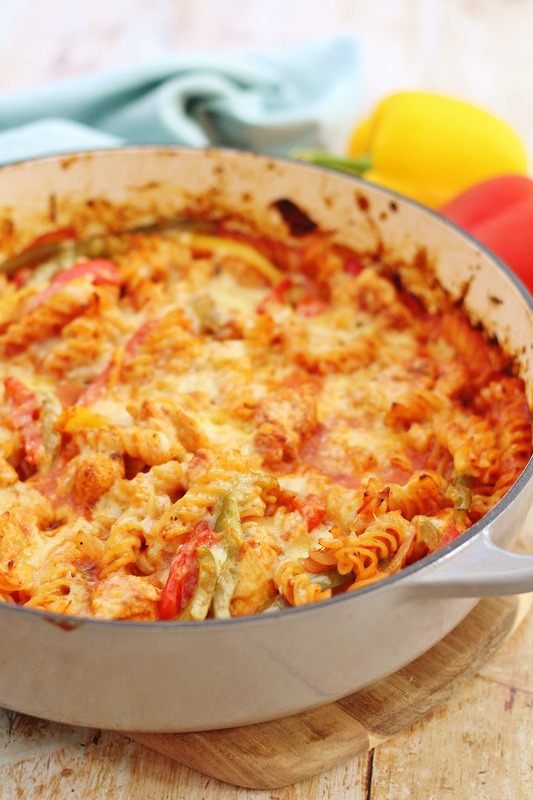 You could add some extra chilli to the filling too, if you really want to ramp up the heat! 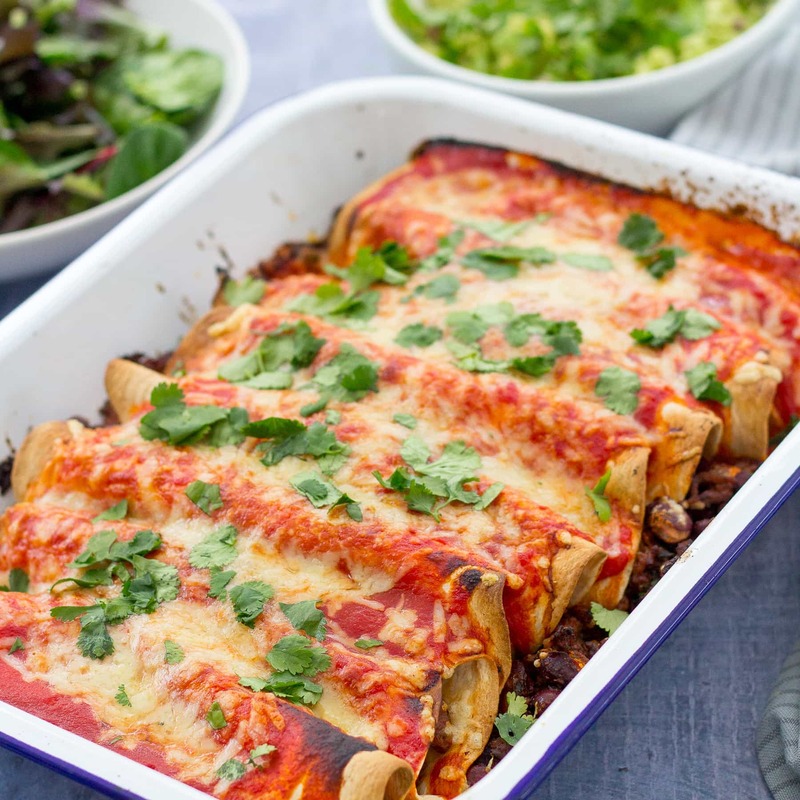 These beef enchiladas would go brilliantly with a Rioja Crianza, a Côte du Rhône, or any other similar wines, such as a Tempranillo or Garnacha from elsewhere in Spain or a Southern French Grenache based wine. If you prefer beer, go for an amber or golden ale. Can you reheat leftover beef enchiladas the next day? Absolutely! Simply put the leftover beef enchiladas on an oven proof plate and cover with foil, then place in the fridge. They will keep like this in the fridge for up to 3 days. When you want to reheat them, preheat your oven to 200C (180C fan / gas mark 6 / 400F). Put your enchiladas into the oven just as they are (on the plate covered in foil) and cook for 15-20 minutes, or until piping hot all the way through. Can beef enchiladas be frozen? I wouldn’t recommend it. Though nothing will go ‘bad’ as such, the tortillas will not be a nice texture. However, what you can do is freeze the beef mince filling. Then, when you want tortillas another time, it will be much quicker. To freeze the beef filling, simply allow it to cool first, then put the filling in a plastic container (don’t forget to label it!) and straight into the freezer. It will keep for up to 1 month like this. Defrost fully in the fridge before using, then fill the tortillas and cover with passata and cheese, before cooking in the oven. You will need to add an extra 5 minutes, or so, to the cooking time to allow for the fact the filling is cold. 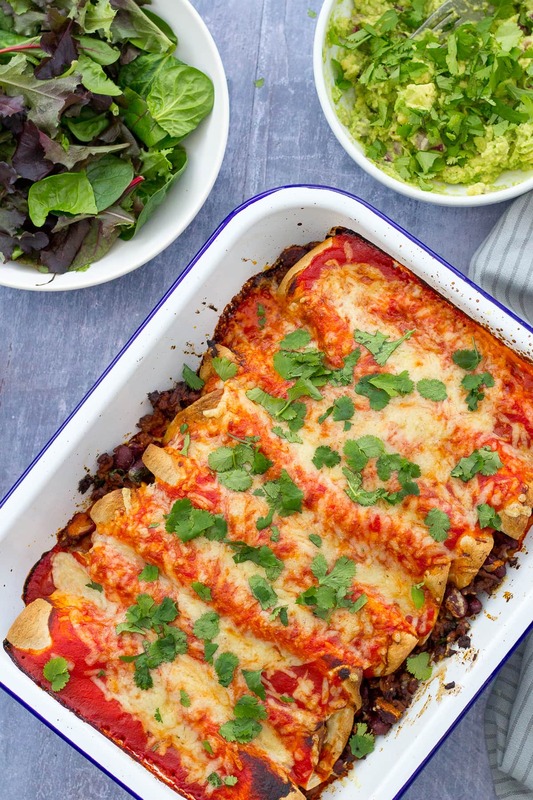 Quick, simple to prepare and packed full of delicious Mexican flavours, these Easy Beef Enchiladas are the perfect dinner to whip up on a busy weeknight, when you still want to eat well. Enjoy with all your favourite Mexican side dishes, such as guacamole and salsa! All your Mexican favourites such as guacamole, sour cream, salsa etc. Put the onion and olive oil in a frying pan. Fry the onions at a low temperature for about 3 minutes, until softened but not browned. Turn the heat up and add the beef mince. Fry for a further 2 minutes until the beef and mince are browned. Turn the heat down, then add the garlic, chilli and spices and cook for 1 more minute. Add 150ml of the passata, all the oregano and some salt and pepper to taste. Bring to a gentle simmer, then add 2 tablespoons of the fresh coriander (cilantro). Turn off the heat and place 1/8th of the filling inside each tortilla and roll the tortilla round the filling. Place the filled tortillas side by side in a roasting dish with the ends facing downwards. Pour over the remaining 350ml of passata and scatter with all the cheese. Bake in the preheated oven for 15 minutes until the tortillas are a little crispy on the edges and the cheese is brown and bubbling. Remove from the oven and scatter with the remaining 2 tablespoons of fresh coriander (cilantro). Serve at the table with a green salad and all your Mexican favourites! Not suitable for freezing (except the beef filling on its own IS suitable for freezing).